The EU Marine Strategy Framework Directive 1 (MSFD) provides a framework in which Member States must take the necessary measures to achieve or maintain 'good environmental status' in all of the EU’s marine waters by 2020. Achieving this objective means that the EU’s seas are clean, healthy and productive and the use of the marine environment is sustainable. The MSFD includes eleven qualitative "descriptors" 2 describing what the environment should look like when good environmental status has been achieved. Commission Decision 2010/477/EU on criteria and methodological standards on good environmental status of marine waters 3 guides Member States on how this objective is to be achieved. the identification of measures or actions that need to be taken in order to achieve or maintain good environmental status. The Commission has to assess whether these different elements meet the requirements of the Directive for each Member State. When necessary, the Commission can also ask for additional information and provide guidance on any changes needed. Member States reported in 2012 after the first implementation phase covering the initial assessment, the determination of good environmental status and the identification of environmental targets. The Commission published an assessment 4 of these elements, concluding that Member States showed limited ambition in setting environmental targets. This assessment also highlighted a lack of coherence and consistency in implementation across marine sub-regions and marine regions. In the next stage of implementation, Member States were required to establish and implement monitoring programmes by July 2014 5 and to notify them to the Commission within three months of their establishment. The monitoring programmes aim to assess the environmental status of marine waters and progress towards the achievement of environmental targets. This report complements the 2014 Commission report and aims to set out Member States’ progress towards more consistent and coherent implementation of the MSFD in order to achieve good environmental status in the EU's marine waters by 2020. The Commission presents its assessment of the monitoring programmes submitted by the Member States listed above. The report assesses the consistency and appropriateness of each Member State’s monitoring programme, as well as looking at regional coherence. The report also provides guidance on any changes the Commission considers necessary. The first part of the report analyses Member States’ monitoring programmes in relation to their determination of good environmental status and associated environmental targets. The second part considers further steps on monitoring to be taken at national and EU level to achieve and maintain good environmental status of the EU’s marine waters by 2020. The accompanying staff working document 10 to this report contains a detailed analysis of each Member State’s monitoring programme in light of the eleven qualitative descriptors in the MSFD, as well as providing specific guidance to each Member State. In order to assess if Member State monitoring programmes constitute an appropriate framework to meet the requirements of the MSFD, the programmes were assessed by considering their purpose, spatial scope, coverage of descriptor categories and environmental targets, implementation timeline, adequacy in relation to the obligations of the MSFD and other relevant legislation, and regional coherence. The twenty Member States reported over 200 monitoring programmes, including nearly 1 000 sub-programmes. 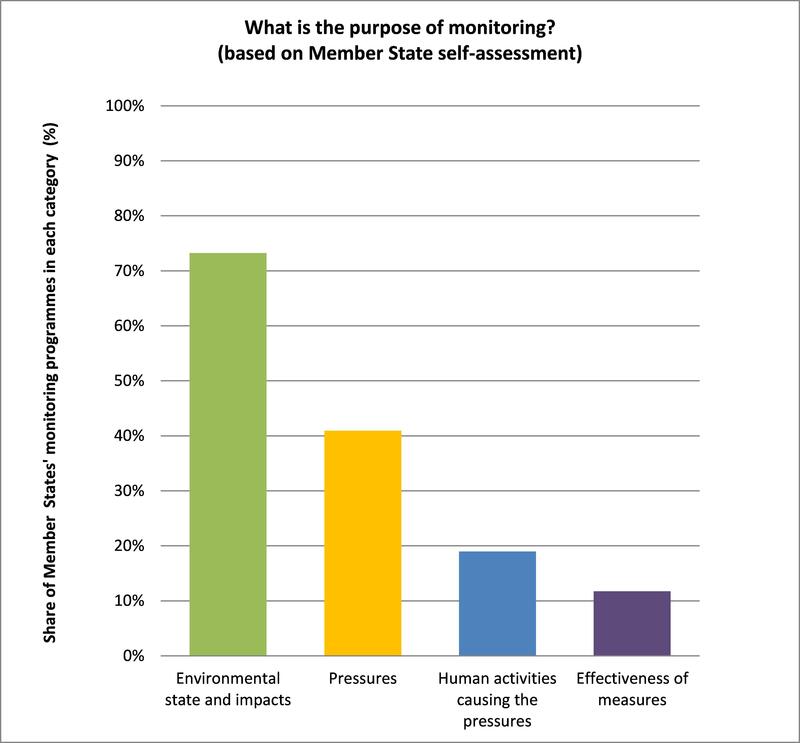 As shown in Figure 1 the majority of monitoring activities (73 %) are focused on assessing the environmental state of Member States’ marine waters and impacts from human activities. 41 % of activities are related to monitoring pressures from human activity (e.g. presence of suspended particulate matter in the water column decreasing water transparency or nutrient enrichment causing eutrophication; or marine litter accumulated on beaches), 19 % focus on human activities causing the pressure (e.g. dredging activities in ports, or agricultural activities and urban waste water discharges, or inappropriate solid waste management), while only 12 % focus on the effectiveness of measures to mitigate these pressures and their impact (e.g. effects of measures to reduce nutrient loss, or to improve solid waste management). This lack of emphasis on assessing measures can be partly explained by the fact that Member States were not required to have their measures operational before the end of 2016 (Article 5(2) of the MSFD). As there is overlap between programmes and their function, the sum of the different monitoring activities is greater than 100 %. The monitoring of biodiversity (Descriptors 1, 4 and 6) accounts for 41 % of the effort. 13 The focus on biodiversity could be explained by the work already being done on monitoring to implement other EU legislation, such as the Birds Directive, 14 the Habitats Directive, 15 the Water Framework Directive, 16 the Bathing Water Directive, 17 the Nitrates Directive 18 and the Common Fisheries Policy Regulation. 19 These include monitoring requirements directly linked with the MSFD descriptors. For instance, under the Birds Directive, Member States have to take into account trends and variations in populations of wild bird species that benefit from special conservation measures. Member States' monitoring of the population, size and abundance of sea birds therefore serve requirements stemming from both the Birds Directive and MSFD. 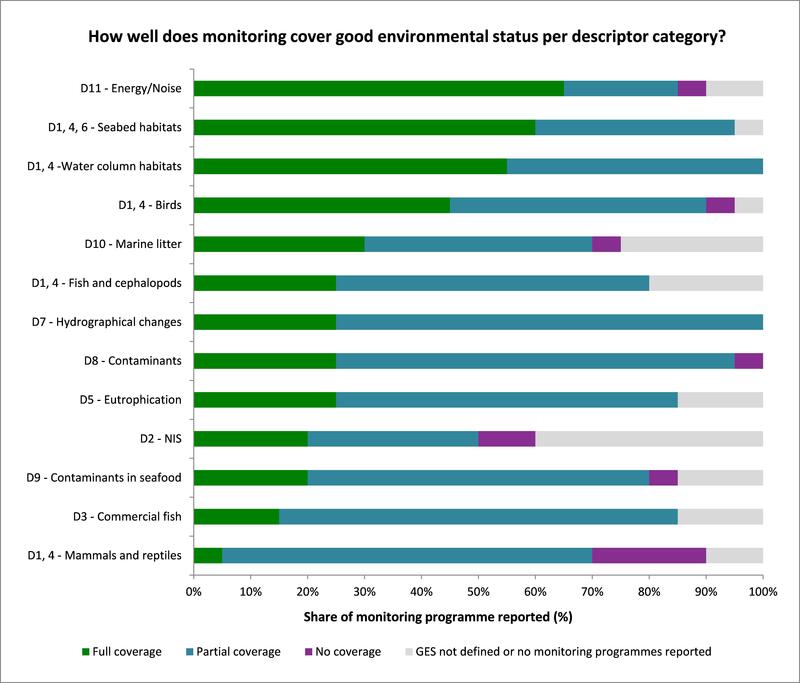 59 % of the monitoring activities are linked with the remaining eight descriptors, with relatively limited monitoring of energy including underwater noise 20 and contaminants in seafood (Descriptors 11 and 9) (4 % each), non-indigenous species (Descriptor 2) (5 %), and marine litter and hydrographic changes (Descriptors 10 and 7) (6 % each). Contaminants in waters (Descriptor 8), eutrophication (Descriptor 5) and commercial fish (Descriptor 3) are better covered (13 %, 11 % and 9 % respectively of the monitoring efforts). beyond Member States marine waters. 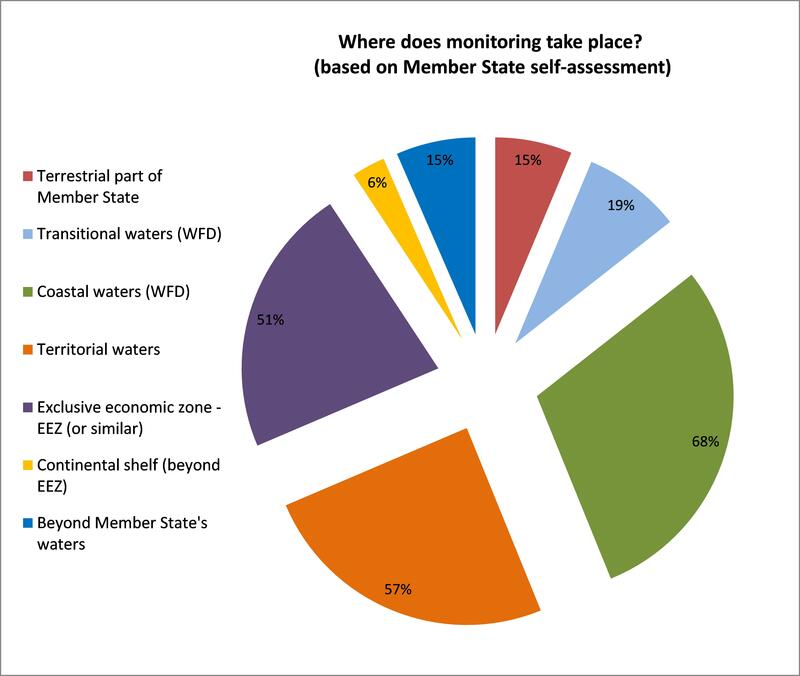 As shown in Figure 2, the highest proportion (68 %) of Member State monitoring takes place in coastal waters, while a high proportion also occurs in territorial waters (57 %) and in the EEZ (51 %). The lowest proportion (6 %) takes place in continental waters beyond the EEZ. As explained above, Member States have generally linked their monitoring programmes to existing programmes required under other EU legislation, which could explain the prevalence of monitoring in coastal waters. Monitoring programmes beyond Member States’ territorial waters are limited. This may be explained by a number of factors, such as the cost of such monitoring and the need to focus on key pressures and impacts, which occur closer to shore. Member States were required to develop and implement their monitoring programmes by 15 July 2014. Figure 3 shows the proportion, by descriptor category, of monitoring programmes expected to be in place by 2014, 2018, 2020 and after 2020. In 2014, the descriptors most monitored by Member States were contaminants in seafood (Descriptor 9), commercial fish (Descriptor 3) and eutrophication (Descriptor 5). By 2020, based on Member States’ self-assessment, the monitoring programmes for eutrophication (Descriptor 5), mammals, reptiles, fish and cephalopods (Descriptors 1 and 4) and contaminants (Descriptor 8) will be in place. For commercial fish (Descriptor 3), hydrographical changes (Descriptor 7), marine litter (Descriptor 10) and seabed and water column habitats (Descriptors 1, 4 and 6), nearly 90% of the monitoring programmes are expected to be in place by 2020. Monitoring programmes for non-indigenous species (Descriptor 2) and underwater noise (Descriptor 11) will require a clear acceleration to ensure proper coverage given the MSFD deadlines for the update of marine strategies by 2018, and achieving good environmental status by 2020. Additional effort is also needed for the biodiversity descriptors (Descriptors 1, 4 and 6) and in particular for those not covered by existing legislation. Figure 4: Date by when Member States expect their monitoring programmes to be in place to cover their good environmental status needs. 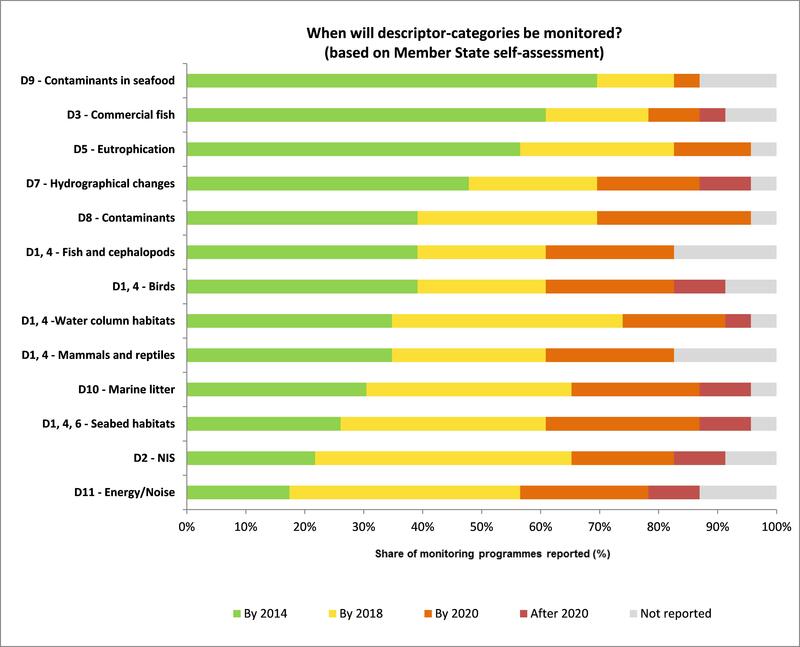 Figure 4 shows the proportion, by Member State, of monitoring programmes expected to be in place to assess progress towards good environmental status by 2014, 2018, 2020 and after 2020. Five Member States reported their monitoring programmes were in place for most categories of descriptors as of 2014. Four Member States had no monitoring programmes in place in 2014. Overall, the monitoring programmes were only partially adequate by July 2014, the date at which they should have been created and implemented in accordance with Article 5(2)(a)(iv) of the MSFD. As a consequence, Member States will have significant gaps in the data available for assessing progress towards good environmental status and environmental targets as required for the 2018 assessment. According to Member States' reports, the situation is expected to improve progressively over time: by 2018, nine Member States are expected to have a full (or nearly full) coverage of the descriptor categories and by 2020 a total of fifteen Member States will have their programmes in place. 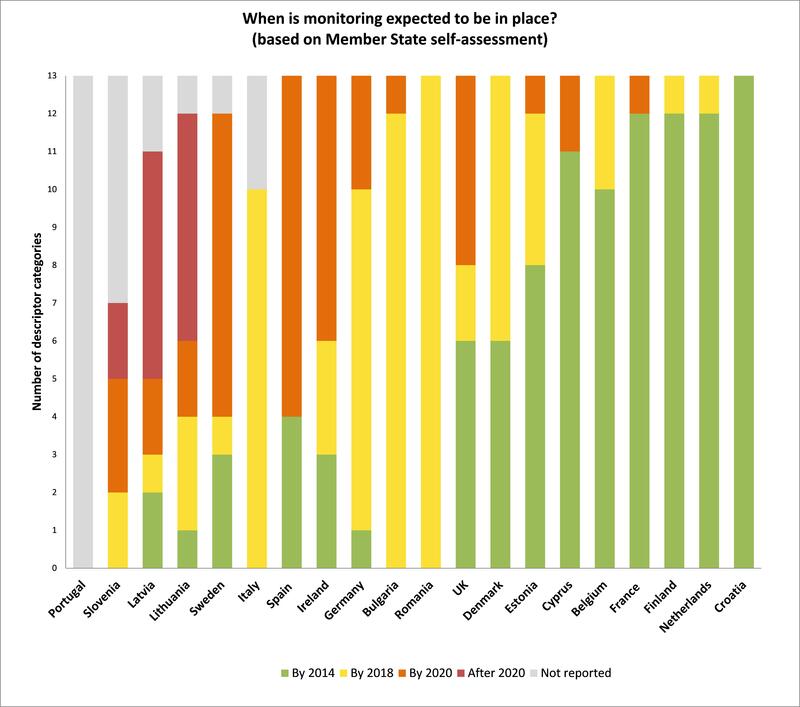 Overall, Member States have for the most part identified 2020 as the point by which most of their monitoring programmes will be fully in place. This is reassuring only insofar as it means that MSFD monitoring is expected to be fully operational by that date. Nevertheless, five Member States have either not reported on their intentions or have announced that their monitoring programmes will not be fully in place even after 2020 – the year by when Member States are required to achieve good environmental status. 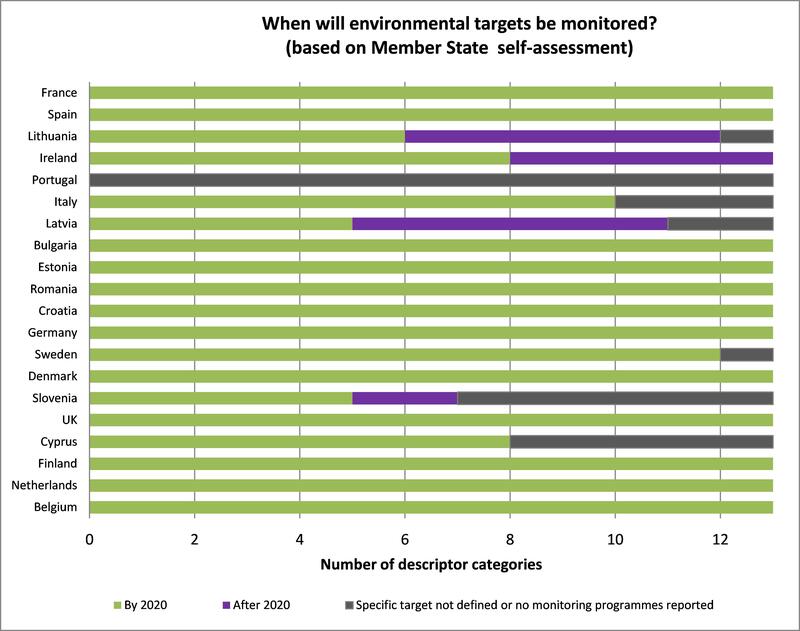 Similar observations can be made for the coverage of environmental targets by Member States’ monitoring programmes, 27 although the timelines reported indicate that Member States generally expect that monitoring needs will be adequately covered before 2020 – see Figure 5. Twelve Member States are expected to have monitoring activities in place to measure the environmental targets they have defined. Ireland plans to cover all targets but will only do so after 2020, by when good environmental status should have already been achieved. The other seven Member States do not plan to monitor part of the targets they have defined. As explained above, targets related to commercial fish and shellfish species (Descriptor 3), eutrophication (Descriptor 5) and contaminants in seafood (Descriptor 9) will benefit from the monitoring programmes set up under other EU legislation. Most of them are either already covered or likely to be covered by 2018. Additional work is needed in order to ensure Member States collect the necessary data to assess progress towards good environmental status and targets. Member States are expected to report on these in 2018, especially for those descriptors where progress has not been sufficient such as non-indigenous species (Descriptor 2), marine litter (Descriptor 10), underwater noise (Descriptor 11) and biodiversity descriptors (Descriptors 1, 4 and 6) not covered by existing legislation. The adequacy of Member States’ monitoring programmes in relation to the requirements of the MSFD was assessed. Detailed findings on each Member State’s monitoring programme are available in the accompanying staff working document. This technical assessment has been made on the basis of the main components of Member States’ monitoring programmes, in particular the aspects and the parameters monitored, the frequency and the spatial scope. The results show Member States’ monitoring programmes to be either ‘appropriate’, ‘mostly appropriate’, or ‘partially appropriate’ in meeting the requirements of the MSFD in terms of assessing environmental status. The combined contribution of each Member State's monitoring programme to each descriptor category is shown in Figure 6. The information presented in this figure was used to assess the number of descriptor categories that are considered to be covered (or not) by each Member State. 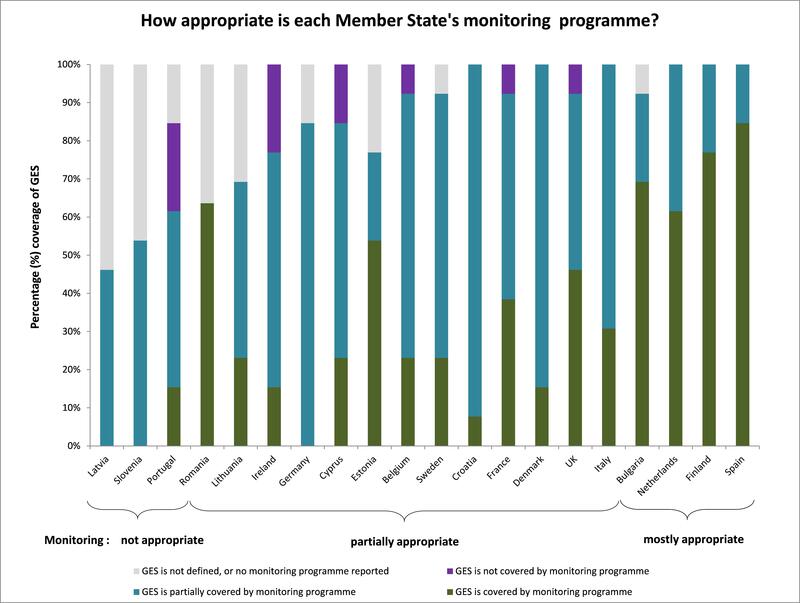 On that basis, conclusions are drawn on whether the Member State's monitoring programme is considered to be mostly, partially or not appropriate (Figure 7). The shortcomings identified in the 2014 Commission report in terms of lack of consistency and comparability in applying Decision 2010/477/EU amongst Member States is confirmed in this assessment. Therefore only an indicative comparative assessment was possible in the context of this report. Most Member States have identified gaps in their programmes and are aware of the key areas that need further work. Gaps have generally been noted in monitoring methodologies and methodological standards (e.g. for seabed habitats and water column habitats and contaminants), lack of monitoring data and knowledge (e.g. for non- indigenous species (Descriptor 2), hydrographical changes (Descriptor 7), marine litter (Descriptor 10) and underwater noise (Descriptor 11)). Some pressures and impacts will only be monitored effectively once a regional approach is in place, given their inherent transboundary nature (for instance those related to mobile species, non-indigenous species and underwater noise). Overall, on the basis of the technical assessment, the Commission considers that none of the Member States' monitoring programmes are fully appropriate and meet the requirements of the MSFD, in particular on monitoring progress towards achievement of good environmental status. Four Member States’ monitoring programmes could be considered as mostly appropriate, thirteen others as partially appropriate and three Member States’ monitoring programmes are not appropriate. Most Member States have based their monitoring programmes on existing monitoring undertaken under other EU legislation or through their respective Regional Sea Conventions. The Water Framework Directive, the Habitats Directive and the Common Fisheries Policy Regulation are the pieces of EU legislation most commonly linked to the MSFD monitoring programmes. In that sense, it can be considered that monitoring programmes are generally consistent with other relevant legal obligations. Marine litter (Descriptor 10) and underwater noise (Descriptor 11) monitoring programmes are the only monitoring programmes that are being put in place exclusively because of the MSFD. Almost all reporting Member States have developed programmes to monitor marine litter, which is encouraging. There is appropriate spatial coverage and frequency of monitoring litter on the beach. In the North-East Atlantic Ocean, ingested litter is also monitored systematically in seabird strandings. A satisfactory degree of consistency in monitoring programmes is found in most marine regions, and links to international and regional standards are clear. Most Member States refer to the monitoring guidance developed by the MSFD Technical Group on Marine Litter, which provides the necessary harmonisation. Nevertheless, there are several areas 28 that need urgent improvement. For instance, litter monitoring in the seabed and water surface and monitoring of micro-litter is far from adequate. There is no systematic and comparable monitoring of the impact of litter on marine animals and nature. Localisation and the extent of human activities generating marine litter are often not covered by the monitoring programmes in place. Member States’ monitoring programmes were also assessed in terms of their regional coherence, within the regions defined in Article 4 of the Directive. Member States have generally referred to regional coordination in their monitoring programmes, in particular by using indicators and standards agreed by the Regional Sea Conventions to assess environmental status under the MSFD. The assessment revealed a moderate to high degree of coherence within the Member States of the Black Sea, North-East Atlantic Ocean and Baltic Sea regions respectively and a low to moderate degree in the Mediterranean Sea region. For Member States in the Black Sea, North-East Atlantic Ocean and Baltic Sea regions, the assessment shows high levels of coherence in some specific cases such as in terms of spatial scope, or the monitored elements. This is the case, for example, for monitoring of contaminants (Descriptors 8 and 9) and marine litter (Descriptor 10) in the Baltic Sea and Black Sea regions. Overall, monitoring across the sea-basin appears more harmonised in the case of the Baltic Sea and the North-East Atlantic Ocean (including non-EU Member States). Member States whose waters are part of the North-East Atlantic Ocean region have created monitoring programmes at regional level for all descriptors; however, further work is required to make these more consistent, for example with regard to non-indigenous species (Descriptor 2) where coverage is limited as only five Member States have reported monitoring programmes for this descriptor. Member States in the Mediterranean Sea region need to develop more consistent monitoring through regional efforts for a number of descriptors, such as in the case of non-indigenous species (Descriptor 2) and underwater noise (Descriptor 11). In addition to transboundary issues covered by some descriptors of the MSFD (such as non-indigenous species, marine litter and underwater noise) some Member States have highlighted the pressures and impacts caused by climate change, ocean acidification, as key issues of a transboundary nature that are directly or indirectly addressed through MSFD monitoring programmes. Member States’ monitoring programmes will help build an improved knowledge base, especially regarding the underwater noise and sea-floor integrity descriptors (Descriptors 11 and 6). This should improve the next assessment by Member States of their marine waters, which is due in 2018. Some Member States have put in place adaptive monitoring programmes, which should ensure they remain appropriate if their good environmental status or target indicators are redesigned in the light of improved knowledge or new standards and practices at regional level, or to reflect changing pressures. Although flexibility is a positive feature, care is needed to ensure that these adaptive monitoring programmes do not lead to monitoring coverage being negatively affected in the longer term. The analysis of the monitoring programmes launched under the first MSFD implementation cycle shows that, even though considerable efforts have been made or will be accomplished in the near future, in most Member States additional action is needed to ensure an appropriate and timely coverage of the monitoring programmes. More progress needs to be made to ensure that approaches are comparable across Member States and to make sure the monitoring programmes are improved so they constitute an appropriate framework that meets the MSFD requirements. An improved coverage should be ensured for descriptors that are not covered, or only partly, by existing legislations. For eight Member States, particular attention should be given to ensure a full and timely monitoring coverage of the targets fixed according to Article 10 of the MSFD. Member States should consider using their monitoring programmes to gauge the effectiveness of their measures, thereby helping them assess the distance to meeting the targets they have set themselves, when updating them as required by the MSFD. In terms of spatial coverage, the analysis shows that monitoring programmes seem to be located where pressure and impacts are likely to be the highest. This should nevertheless be confirmed by an appropriate analysis of the risks so that priorities in terms of monitoring are identified on a technical and scientific basis. Only a few Member States had operational monitoring programmes in place in 2014, while many are only expected to be fully in place by 2018 or even 2020. Therefore urgent progress on monitoring is needed to meet the requirements of the MSFD including the 2018 updates of the initial assessment of their marine waters and good environmental status, and importantly the achievement of good environmental status by 2020. Monitoring programmes are not always adequate to ensure the effective monitoring of the status of the EU’s marine waters, towards achieving good environmental status and the associated targets, set by Member States. This is particularly the case for non-indigenous species, marine litter, underwater noise and biodiversity descriptors not covered by existing legislation. Further coordination among Member States, particularly through action at regional and sub-regional level, is essential to deliver consistent and comparable data and improve the spatial scope of monitoring programmes. This could potentially reduce costs, through more effective monitoring across disciplines and among Member States. take into account their programmes of measures when updating these monitoring programmes in accordance with Article 17 of the MSFD, so as to be able to measure their effectiveness in meeting the Directive's objectives. on the basis of the Member States' individual assessments (available in the accompanying staff working document), launch a specific and focused dialogue with Member States at significant risk of not meeting the requirements of the MSFD in order to ensure their compliance with the Directive. Directive 2008/56/EC of the European Parliament and of the Council of 17 June 2008 establishing a framework for community action in the field of marine environmental policy (Marine Strategy Framework Directive), (OJ L 164, 25.6.2008, p. 19). The 11 qualitative descriptors are defined in Annex I of the MSFD and include D1– Biodiversity, D2 – Non indigenous species, D3 – Commercial fish and shellfish, D4 – Food webs, D5 – Eutrophication, D6 – Sea-floor integrity, D7 – Hydrographical changes, D8 – Contaminants, D9 – Contaminants in seafood, D10 – Litter, D11 – Energy, including underwater noise. For the purpose of this report the Biodiversity descriptors (D1, 4 and 6) have been grouped according to the main species groups and habitat types, as follows: birds, mammals and reptiles, fish and cephalopods, seabed habitats and water column habitats. This additional grouping results in a total of 13 descriptor categories. Commission Decision 2010/477/EU of 1 September 2010 on criteria and methodological standards on good environmental status of marine water (OJ L 232, 2.9.2010, p. 14). This requirement is provided for in Articles 5(2)(a)(iv) and 11 of MSFD. This obligation in the Directive applies only to the 23 coastal Member States, and not to the 5 land-locked Member States. For the purposes of this report, September 2015 was used as a cut-off date. The UK report excluded waters surrounding the British Overseas Territory of Gibraltar. Malta and Poland have since submitted their reports, but given the late submission, an assessment of these could not be made for the purposes of this report. To date (October 2016) Greece has not yet submitted its report. The Commission will, at a later stage, communicate and make public its assessment and guidance to the Member States not included in this report. For Portugal and the United Kingdom, the Commission’s initial recommendations in its 2014 report were updated to reflect the data on Macaronesia for Portugal and on Gibraltar for the UK. This graph does not include data from Latvia, Italy and Portugal as their reports were submitted in a non-standardised structure. The monitoring programmes cover several spatial areas, therefore could refer to coastal and territorial waters. Percentages are calculated based on total number of monitoring sub-programmes reported. This descriptor refers to the introduction of energy in the marine environment, including underwater noise. Given the scientific and technical development behind this descriptor is still maturing, Member States have exclusively concentrated their efforts on underwater noise, and the descriptor will be referred to as such for the purposes of this report . Transitional waters are bodies of surface water in the vicinity of river mouths which are partly saline in character as a result of their proximity to coastal waters but which are substantially influenced by freshwater flows as defined by Directive 2000/60/EC. Coastal waters extend to 1 nautical mile from the baseline, as defined by Directive 2008/56/EC of the European Parliament and of the Council. Territorial waters (out to 12 nautical miles), Exclusive Economic Zone (EEZ) (up to 200 nautical miles), Continental Shelf beyond EEZ as defined under the United Nations Convention on the Law of the Sea. 'Beyond Member States’ marine waters’ refers to areas outside the jurisdiction of the Member State (including in waters of neighbouring States). The sum of the different monitoring activities is greater than 100%, as programmes and their functions overlap. No data from Latvia, Italy or Portugal are included in this chart, as their reports were submitted in a non-standardised structure. ‘Not reported’: timeline of coverage of good environmental status not reported. As explained in footnote 2 above, 13 categories of descriptors have been defined. Some of these issues such a as marine litter are already being considered in the framework of the common implementation strategy of the MSFD. International commitments include the Rio+20 process (United Nations conference on sustainable development) and the 17 sustainable development goals of the 2030 Agenda for Sustainable Development adopted in September 2015. Roadmap on the Fitness Check of monitoring and reporting obligations in environment policy, http://ec.europa.eu/smart-regulation/roadmaps/index_en.htm. The MSFD requires from Member States detailed and coordinated input. In order to facilitate this work, Member States and the European Commission have set up an informal programme of coordination, the Common Implementation Strategy (CIS).